Anybody who is slightly apprehensive about travelling abroad will naturally consider taking out travel insurance, to ensure that if the worst happens you'll have some kind of support, but if you're planning on going further afield than Europe and/or you plan on carrying valuable items, it's advisable to take out some kind of cover no matter how seasoned a traveller you are. As British citizens, we are all entitled to free emergency healthcare in any EU member state (for a full list of current member states visit the EU's 'Europa' website). To ensure that this is the case, it's recommended you get a European Health Insurance Card (EHIC) by applying online at the Department of Health website or getting the forms from you local Post Office. This will avoid delays at critical moments should you urgently require medical assistance. However, it's fair to say that not all countries in the union have healthcare systems as good as that in the UK. If you're planning on doing any kind of activity which may result in serious injury - the kind which might require a helicopter to get you home - then you should seriously consider taking out insurance regardless. Outside Europe, British citizens may or may not be entitled to free emergency healthcare. Canada and Australia have a reciprocal agreement with the UK and a handful countries have a healthcare system which will allow you treatment regardless of your nationality, but many countries do not. That's not to say you'll be left to die - doctors throughout the world subscribe to the Hippocratic, oath so you'll always be treated, the difference is, you may well be landed with a hefty medical bill, particularly in the USA. Most of us don't tend to carry our valuables abroad and indeed, we should only carry what is necessary for the trip. However, in today's technological world, laptops and other expensive electronic gadgets are quickly becoming part of that category. Travel insurance also covers you for such things as missed or delayed flights, lost luggage and the like, so if you have a hectic schedule - or if you're passing through Terminal 5 - you may also like to consider the idea. Be warned however, that what insurers pay out for lost or stolen goods will not usually amount to their original value and there's nearly always a fairly low maximum limit for lost cash. As with all types of insurance, it's best to go with companies that are specialised in the field. 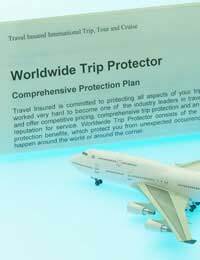 In this case, a Travel Insurance Company, as opposed to a supermarket or other type of company which happens to offer travel insurance as a sideline. Banks and the Post Office also offer fairly competitive travel insurance (the latter's policy is underwritten by a real insurance company). You can purchase cover for one single trip, or annual multi-trip cover for people who travel a lot. However, if your plans are open ended then it's in your best interests to find an international travel insurance company who are flexible when it comes to extending your policy while you're abroad. Most UK-based insurers, even with multi-trip annual cover, require each and every trip to begin and end in the UK and be less than a certain number of days (usually 31) - not much use if you're planning on being spontaneous! You can find such insurers with a little research on the internet - make sure to get a feel for those companies that are used to dealing with long distance travellers. Of course, online forums and blogs are also a very useful resource - you can get to know more experienced travellers online and get their recommendations. You may feel young and healthy and possibly even invincible, but however unlikely you think you are to fall ill, a medical bill for even the simplest things can be devastating. The USA is infamous for the high price of treatment if you're not insured. If you happen to be hit by a car and get your leg in plaster, you could be looking at up to £7000!